Superior Shores 9 is a quaint one bedroom, one bathroom vacation rental cabin in Grand Marais, MN. This cabin is set back from the lake with a peek-a-boo view of Lake Superior from between the lake-side cabins. Enter into the living room / dining room area of this adorable cabin. Grab a seat on the couch and enjoy a cup of coffee. The corner fire place is perfect for those chilly early summer evenings. The cabin has four rooms- the living room/dining room, kitchen, bedroom, and bathroom. The kitchen is the largest available at the Superior Shores cabins and has everything you need to prepare a homecooked meal. Enjoy this recently updated kitchen. The bedroom features a full sized bed and plenty of natural light through the window. Enjoy a peaceful night`s sleeps at Superior Shores 9. The bathroom has a walk-in shower. Consider Superior Shores 9 for your next North Shore vacation. This cabin was once part of a mom and pop resort and is set back from the other cabins for added privacy. Located on the quiet, one-lane Croftville Road, Superior Shores #9 is just 2-1/2 miles from downtown Grand Marais. This makes it close enough for shopping, harbor walks, and the arts, yet just far enough away to escape to the quiet of the woods and water. There is direct access just through the cabins to the cobblestone shoreline where you can enjoy an evening of watching the stars and making s’mores. This one bedroom, one bathroom cabin is located on one easy access level. The living room has a cute corner fireplace for those days when you just want to warm up with a good book. Games and small TV for movies also offer evening entertainment. This cabin is more modern than most small cabins and is a perfect little getaway from the hustle and bustle of life. The convenient location of Superior Shores #9 puts you just minutes away from many Lake Superior attractions and dining options. Less than 5 minutes away, in Grand Marais, you will find a wide variety of quaint small-town mom & pop shops and a variety of restaurants. Take a stroll along the harbor or out to Artist's Point to enjoy the beautiful lakeside scenery. Up for more of a challenge? There are several state parks and miles of hiking trails just a short drive away, including Judge C. Magney State Park, home to the infamous Devil's Kettle waterfall. 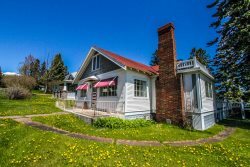 The location is also perfect for those taking a class at the Grand Marais Art Colony or North House Folk School. Due to the cabin's small size, it is not recommended for children. The cabin was perfect and cozy. The location is perfect as well, since we love Croftville. The bed was too springy.